Superalloys: the choice for GenIV? My previous post (Metallurgy: Austenite vs. ferrite) generated some great comments. There's a lot of interest in the possibility of using nickel-based superalloys (such as the Hastelloys) for major components in GenIV fast reactors. In between the day job and some business travel, I did as much reading as I could along these lines. First, I summarize some of what I've learned from my reading, and then go out on a limb with my crystal ball regarding the use of superalloys in next-gen reactors. But before even the first item, let's take a quick aside. One of the "new things" in the superalloy literature are cobalt-based alloys for applications such as fossil-fired turbines. We can dismiss this possibility for the simple reason that cobalt and neutrons don't mix -- 59Co activates to 60Co, and becomes a significant radiological hazard to the reactor personnel. We can rest assured than cobalt-based superalloys, and even nickel-based superalloys containing more than a trace quantity of cobalt, are ruled out. The fast reactor research programs in the 70s produced quite a lot of irradiation data for superalloys. The Rowcliffe et al. paper summarizes them quite readably . Murty and Charit  and Nanstad et al. also cover on the topic. These helium bubbles are the primary cause of the swelling and shape-change seen in irradiated superalloys, which can affect the tight tolerances needed for precision machinery as well as weakening the material. Superalloys always contain some amount of carbon; radiation can induce the formation of M6C and M23C6 precipitates, where "M" denotes "metal", mostly Cr but with some fraction of the rest of the cations. These are blamed for destroying the swelling resistance of the material and allowing the helium bubbles to begin their dirty work. Murty and Charit suggest that superalloys should certainly be useful in regions of the reactor with lower radiation flux (i.e., steam generators) but more data is needed, as well as new alloys, to truly understand to what degree the radiation damage, particularly helium and swelling, can be ameliorated. Nanstad et al. studied a series of alloys: Nickel-chrome-iron "800H", nickel-cobalt "617", and a series of steels. The 617 was interesting from a fundamental point of view, but its cobalt content (~12%) will make it uninteresting for real applications. The 800H showed appealing properties, especially when processed differently to improve its grain boundaries, but swelling due to transmutant helium is still a threat. OK, so that's a quick once-over of some literature. Now comes opinion. GenIV reactors are going to show spectacular temperature / dose combinations, which will result in huge amounts of nickel transmutation to helium in any alloy. My guess -- and I emphasize that this is a guess -- is that any in-core metal parts are going to have to be nickel-free in these new reactor concepts. Rowcliffe et al. discussed concepts such as mechanical alloying to produce nanoclusters in the nickel superalloy matrix to vacuum up the point defects and helium, but this approach has really only been successful for ferritic steels. The problems of GenIV materials are simply extraordinary, and as a taxpayer and voter I say we need to pursue multiple parallel tracks of research towards the goal of clean energy via GenIV, including superalloys. But my personal crystal ball says that the oxide-dispersion-strengthened iron-chrome steels are the most likely solution. A. F. Rowcliffe, L. K. Mansur, D. T. Hoelzer and R. K. Nanstad: Perspectives on radiation effects in nickel-base alloys for applications in advanced reactors. Journal of Nuclear Materials V392, (2009), P.341-332. K. L. Murty and I. Charit: Structural materials for Gen-IV nuclear reactors: Challenges and opportunities. Journal of Nuclear Materials V383, (2008), P.189-195. R.K. Nanstad, D.A. McClintock, D.T. Hoelzer, L. Tan and T.R. Allen: High temperature irradiation effects in selected Generation IV structural alloys. Journal of Nuclear Materials V392, (2009), P. 331-340. Everyone has heard of "stainless steel." By convention, a stainless steel is an iron based alloy containing a large addition (several percent to 20 percent) of chromium. Chromium at the surface forms a thin, adherent, nearly impermeable, and self-healing layer of chromium oxide, which slows or prevents the attack of the iron base metal by oxygen or other corrosives. But here's a trick: stick a magnet to a piece of stainless steel. Most of the time, the magnet will stick. This is "ferritic stainless steel." Every now and then, however, a part made from more highly alloyed (and thus, more expensive) stainless steel will be "austenitic stainless steel," and will be non-magnetic. Typically austenitic stainless steels will contain even more chromium and 10 or 20 percent nickel. As a result, they're expensive, but some applications require their very high properties. If you cooled pure liquid iron, it crystallizes into delta-ferrite, which has the crystal structure shown in the first figure. ("BCC") As it cools from white-hot to dull-red, the crystals will transform to gamma-austenite, which is the second crystal illustrated ("FCC"). Cool it down from red hot to black but still very warm, it will transform again, back to ferrite, but now referred to as "alpha." This is called an allotropic transformation, and several chemical elements (like plutonium, tin, or carbon [graphite, diamond]) undergo similar reactions. Impurities -- called alloying elements when they're added on purpose -- change the temperatures where these changes happen, and can cause both phases to coexist in a particular temperature range. Adding chromium to iron gives ferritic stainless steel; the chromium atoms substitute for the iron atoms at random. Nickel, however, is an austenite stabilizer and at additions around 10 percent will cause the iron-chromium-nickel alloy to switch to austenite at room temperature. The austenitic steels are often used for higher temperature applications because they can withstand a hot, corrosive environment and maintain mechanical properties to somewhat higher temperatures than the ferritic grades. Both are used in large amounts in different parts of a modern, GenII light-water reactor. A GenII reactor, or even the GenIII / III+ ones under construction, will see outlet temperatures in the low-300s Celsius. The GenIV concepts will push as far as 1000°C, and the current crop of materials would turn buttery there. 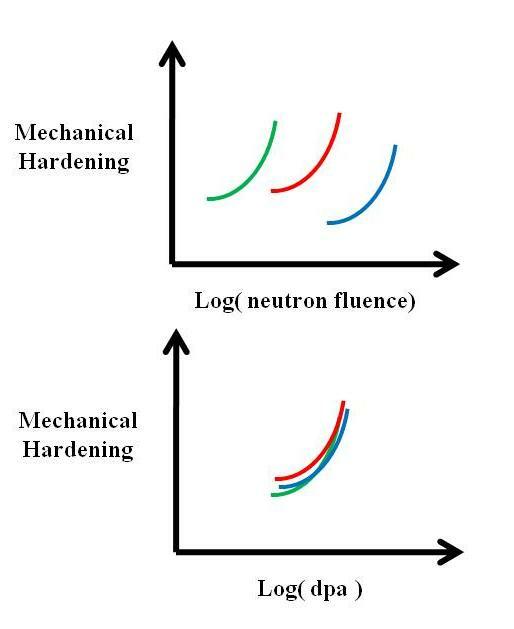 The austenitic alloys show better resistance to creep at high temperature than the ferritics, but under neutron bombardment they also suffer void swelling which can compromise their mechanical strength. There's been a large amount of work on nickel base superalloys for these types of applications; Hastelloy X, as one previous commenter mentioned, being a strong contender. A nickel superalloy is "nickel-based," but even that is more of an honorary distinction: modern superalloys can contain dozens of alloying elements, with nickel being barely more than 50%. Superalloys have nearly seven decades of proven use in jet engines and land-based gas turbines. However, even these very super alloys will be hard pressed to withstand the temperatures and neutron doses and corrosive coolants in a GenIV plant. They have good potential, particularly for the regions of a GenIV plant operating short of the highest conceived temperatures, but problems such as radiation induced segregation and radiation induced precipitation of particles such as carbides at grain boundaries can be pronounced. Nickel also suffers internal helium generation during neutron irradiation, which can form small dispersed bubbles. Undoubtedly, superalloys will have a part in GenIV reactors but it remains to be seen how large or small. The most interesting new class of materials are the F/M "ferritic-martensitic" materials and the ODS "oxide dispersion strengthened" materials. Recall that austenite is the higher-temperature phase of iron; quench austenite in water and instead of transforming to the low-temperature ferrite phase, the rushed reactor forms martensite, which is a slight variation on the ferrite structure. Martensite, however, is spectacularly hard but brittle. Mixing ferrite and martensite into a structure gives composite properties superior to either alone. The fossil energy research programs resemble nuclear in that they are always striving for longer-life components at higher temperature. Fossil energy research has yielded a number of promising F-M steels that may show good corrosion, temperature, and neutron resistance. However, like for superalloys, the database of long-term radiation-exposure data is incomplete. A variation on this theme is ODS, where F-M materials have a fine dispersion of yttrium oxide particles less than 2 nm in diameter dispersed through the structure. This high density of nanoparticles results in a large amount of matrix-particle surface area, which vacuums up radiation-induced defects such as vacancies or helium, significantly reducing the action of radiation induced segregation and precipitation. Again, long term studies are underway, but the smart money is for a mix of superalloys and ODS alloys in the GenIV prototypes. T. R. Allen and J. T. Busby: Radiation damage concerns for extended light water reactor service. JOM V61(7), (2009), P.29-34. T. Allen, H. Burlet, R. K. Nanstad, M. Samaras and S. Ukai: Advanced Structural Materials and Cladding. MRS Bulletin V34(1), (2009), P.20-27. First, let me thank the various readers for some good comments on the previous posts, I always value feedback. Also thanks to Yes Vermont Yankee for the advertising. Any comments and especially suggestions are welcome! Last time, I discussed some of the broad problems present in engineering materials for a LWR environment. This new series of posts will try to extend a few of these concepts to GenIV (and conceivably fusion) materials. Today's topic is not what materials to put in a pebble-bed or fluoride-cooled reactor; rather, today's topic is why you probably can't use the same materials that have worked so well over the last 60 years in LWRs. As dpa accumulate, a number of effects are seen. There are firstly the microstructural changes we previously discussed, such as radiation induced segregation of alloying elements to defects in the structure. Also seen are macrostructural changes, such as swelling and growth. Was  defines swelling as an increase in volume of a part with irradiation, and growth as a change in shape at constant volume. Because reactor parts must be precisely fitted together -- this is a precision piece of machinery, of course -- the ability to control, reduce, or predict such effects are important. So our interest here is to relate damage, as quantified by dpa, to GenIV materials. The recent article of Guerin et al. has an excellent graph. That graph contains some sub-parts from a DOE brochure, so I could probably claim "public domain" and put the whole figure here. However, let's error on the side of appeasing the copyright gods again and make a fair-use schematic summary. This chart illustrates the range of temperature and dpa anticipated to be seen in the different advanced concept reactors (VHTR, very high temperature reactor; SWCR, supercritical water cooled reactor; LFR, lead fast reactor; SFR, sodium fast reactor; GFR, gas fast reactor; MSR, molten salt reactor). What this tells us is that the closer a reactor is to the bottom-left of the graph, the easier it will be to build. The closer it is to the top-right, the more difficult. More dpa will result in more changes to the material structure and properties over time. Higher temperature and more aggressive coolants (like lead or molten salt) will result in more degradation to the materials whether a radiation field is present or not. 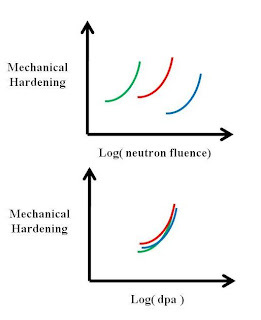 Amelioration of these damage effects and design of damage resistant materials are a major thrust of research in government, academic, and industrial labs at the moment: the primary showstoppers preventing advanced reactor development are likely to be the ability of the materials to withstand these temperatures and damage levels for years on end. As this series of posts continue, we'll look into materials selection and design to withstand these damage levels. D. Butler: Nuclear power's new dawn. Nature V429, (2004), P.238-240. L. R. Greenwood: Neutron interactions and atomic recoil spectra. Journal of Nuclear Materials V216, (1994), P. 29-44. G. S. Was, Fundamentals of Radiation Materials Science. 2007, Springer, Berlin. Y. Guerin, G. S. Was and S. J. Zinkle: Materials Challenges for Advanced Nuclear Energy Systems. MRS Bulletin V34(1), (2009), P.10-14. When you're a freshman in engineering college, the different departments try to recruit you into their program, over the others. The most compelling argument the Materials Science and Engineering program can make is, "we're the branch of engineering that makes the others possible." The program I attended likened MSE to the spokes of a wheel, where physics, chemistry and math were the hub and the other engineering disciplines the tire. In nuclear energy, this is no different. Someone -- Google fails me to find the correct attribution -- said that a reactor is just a design until the metallurgists say if it can be built or not. The (historical) cradle of the nuclear industry was the US national energy lab system. Although nuclear is now only a small part of their portfolio, the energy labs -- the full constellation of LBL, triple-L, Sandia, Oak Ridge, Idaho, Argonne, Savannah River -- are today the preeminent materials science facilities in the US, and arguably the world. Even in a "simple" GenII-type light water reactor, there's still an amazing amount of advanced materials science. First, operating temperatures of the in-core materials might run above 300°C, which will result in the degradation of many materials over time due to changes in their microstructure. As a similar example, in the World Trade Center, the towers fell because the steel suffered changes ("recovery") to its defect structure that were kinetically forbidden at room temperature, but allowed at burning-jet-fuel-temperature; the steel didn't come close to melting. Second, water itself can be a very corrosive environment unless materials are well-selected and -manufactured. Third, irradiation has profound effects on materials properties and behavior over long times. Most significantly, these three effects can often combine in ways that are difficult to foresee. Metals and ceramics, at the scale of nanometers to millimeters, are made up of "grains." (See figure.) Each grain is a single crystal, which means that the atoms are arranged in a regular order across the extent of each grain. Where two grains meet is a "grain boundary," a region of slight atomic disorder and where atoms are more loosely packed (Second figure). 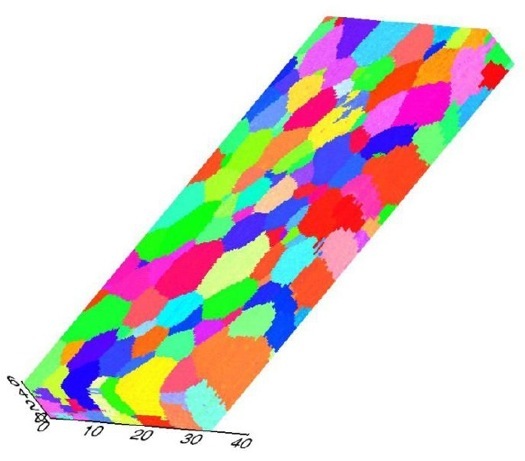 "Second-phase particles," an example of which might be non-metallic carbides in steel (Third figure), often preferentially form at grain boundaries. Solute and impurity atoms often prefer to move to grain boundaries because of the looser atomic packing. Sulfur and phosphorus, for example, are unavoidable impurities in commercially produced steels, and segregation of these contaminants to grain boundaries at moderate temperatures over long times are known to cause embrittlement by making the materials susceptible to mechanical failure along the grain boundaries. How does this apply to nuclear materials? In a light water reactor the materials (often alloy steels, nickel alloys, or zirconium alloys) and simultaneously subject to high temperature, a corrosive environment (water itself) and a radiation flux. As temperature increases, the atoms in the crystals vibrate about their equilibrium positions with higher and higher amplitudes. Further, as temperature increases, "vacancies" form. A vacancy is an atomic position in a crystal that is not occupied by its atom. Vacancies disappear at absolute zero: all atomic sites are occupied (theoretically). At a metal's melting point, perhaps 1 atomic site in 100-10,000 (depending on many factors) will be a vacancy. Because atoms are wiggling around more energetically at high temperature, and the chances of an atom being next to an empty site as temperature (and vacancy fraction) increases, atoms are more likely to hop from one atomic position to an adjoining vacancy, resulting in "diffusion." Any of the atoms now surrounding the vacancy's new position have an equal chance to change places with it, so the first hopping atom is unlikely to return to its original position, which means the vacancy, statistically, moves around the crystal. Because the chances of any atom making such a jump are perfectly random, it's possible to find that atoms move, on the average and under most circumstances, from areas of high atomic concentration to low atomic concentration. This is mathematically the same as what happens when someone opens a bottle of perfume on one side of a room, and you smell it on the far side of the room a few minutes later. 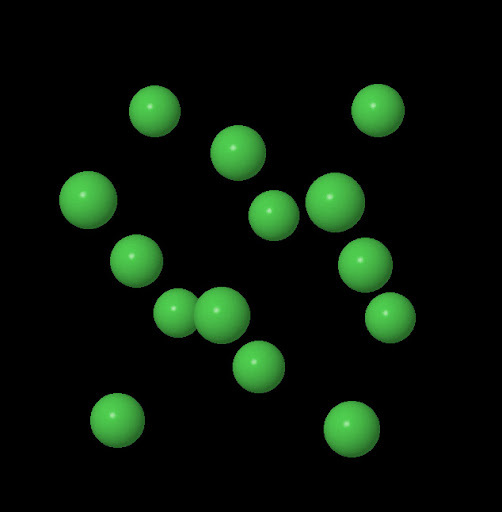 Even if the air in the room is perfectly still, Brownian motion moves the perfume molecules at random and they eventually fill the room evenly. Solute atoms, perhaps the sulfur and phosphorus naturally present in an alloy, hydrogen introduced by the reaction of water (H2O) with the alloy's surface, or helium created when nickel or boron captures a neutron, will move around the metal due to diffusion at operating temperatures. These atoms often try to move to grain boundaries, or to the surfaces of second-phase particles like carbides, due to the slightly greater amount of "elbow room" at these locations. These effects (helium excepted) are all present in any high temperature materials system, such as fossil-fuel fired turbines or jet engines. Where these problems become interesting is when neutrons -- obviously present in a reactor -- bombard the material. Neutron-induced perturbation of a material is measured in "displacements per atom," or "dpa." A neutron carrying enough energy can bump an atom out of its lattice site, turning the atom into an "interstitial" and leaving a vacancy behind. 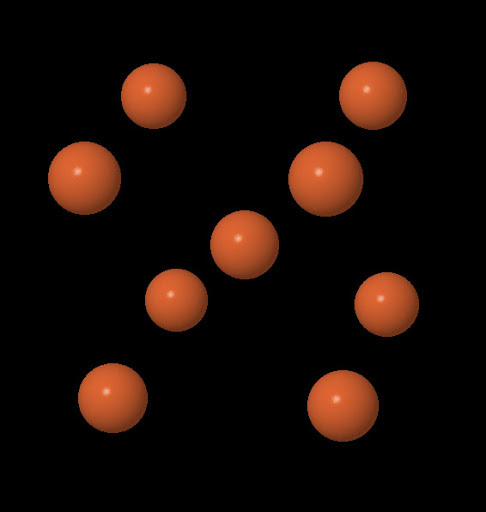 At a level of 1 dpa, this means that each atom has been moved an average of one time. This would be expected to completely destroy the material's crystal structure; in semiconductor processing, ion implantation into silicon wafers amorphize the surface of the material at levels well below 1 dpa. However, primarily due to the elevated temperature operation, almost all of these atoms quickly relax to their equilibrium states in a self-healing process. However, excess vacancies or other defects can remain, and result in even faster diffusion. As a result, a commonly observed effect in steels and other materials is "radiation induced segregation," RIS. In addition to the usual suspects such as sulphur, phosphorus and helium, even the major components like nickel, copper, and chromium are induced to move around. These major alloying additions cost money, so they're only added to the base steel for a reason. An example would be chromium, which reacts to form chromium oxide on the surface of a steel -- this adherent chromia layer is what makes stainless steel stainless. Moving the solutes firstly depletes them from their intended purpose and, by driving them to the grain boundaries or other defects, can result in embrittlement of the material. Reactor pressure vessel steels are seen to form 1-5 nanometer diameter copper- and manganese-rich precipitates over time, which will both harden but embrittle the steels. It's a tribute to the engineers and scientists working at the national labs in the 1950s, 60s and 70s that, despite all of these driving forces towards materials degradation, the GenII reactors are still going strong and have the potential to keep running for decades more . Even so, a PWR or BWR might show operating temperatures in the range of 280-320°C and thermal neutron fluxes over time of perhaps 7-80 dpa. (See .) The concepts for high-temperature, high-thermodynamic-efficiency, high-burnup reactors of GenIII+ and GenIV will require much high temperatures (up to 1000°C), enormous doses (up to 200 dpa) of thermal and fast neutrons, and far more chemically aggressive environments such as salt-based coolants (, ). In later posts we'll explore those more advanced materials problems and some potential solutions. R. Szilard, P. Planchon and J. Busby: The case for extended nuclear reactor operation. JOM V61(7), (2009), P.24-27. C. Cabet, J. Jang, J. Konys and P. F. Tortorelli: Environmental Degradation of Materials in Advanced Reactors. MRS Bulletin V34(1), (2009), P.35-39. A few days ago I saw a link to a CNN-dot-com video asking if nuclear powerplants were responsible for a town in Georgia having a cancer rate 51% higher than the national average. I didn't have time to watch the video then, and I can't find it now. If you can find it, please leave a comment. 2. Someone worked out some numbers and found the town had more cancer than average. CNN left out the assumptions and the confidence intervals. 3. They interviewed some locals (who are normally only on TV describing what the tornado did to the trailer park). 4. The locals assume the powerplants are responsible for the cancers, including grampa the tobacco farmer's lung cancer. Again, you don't need to see the actual CNN bit to know where the scientific fallacies are. A better method would be to compare the town to the deep-south or Georgia cancer rate (rural Georgia; excluding Atlanta. Urbanites are statistically healthier than country folk). I imagine using a non-biased subset for comparison would remove all statistically significant differences. A rural Georgia town will have high cancer rates due to fried food, tobacco, and alcohol. A nuclear plant is hardly needed. Will we ever control fusion? Are NIF and Z good investments of taxdollars?